Standing among the top 10 business houses in India, the Bajaj Group’s footprint stretches over a wide range of industries, spanning automobiles (two wheelers manufacturer and three wheelers manufacturer), home appliances, lighting, iron, steel, insurance, travel and finance. The group’s flagship company Bajaj Auto Ltd. is ranked as the world’s fourth largest three and two wheeler manufacturer and the Bajaj brand is well-known across several countries in Latin America, Africa, Middle East, South and South East Asia. At a press conference at the company’s head office in Pune, India, held to educate the Sri Lankan media delegation with the backing of its Sri Lankan counterpart David Peiris Motor Company Ltd. (DPMC), the company outlined its annual financial statistics. The company’s business and financial performance for the financial year 2017-18 saw total sales of 4,006,791 units, posing a growth of 9%. During this successful period, a total of 3,369,334 motorcycle units were sold, growing by 5%, with commercial vehicle sales amounting to 637,457; a growth of 43%. Net sales saw an increase by 15.6 % to INR 24,700 crore. Operating Earnings Before Interest, Taxes, Depreciation and Amortisation (EBITDA) increased by 7.7% to INR 5,145 crore, the highest ever recorded by the company. Operating EBITDA margin was 20.2% of net sales and operating income, and operating profit increased by 8% to INR 4,829 crore. The operating profit margin was 19% of net sales and operating income. Following a successful financial year for 2017-18, the company also shared its business performance for the first half of financial year 2018-19. Total sales for this period stood at 2,566,085 units, once again the highest ever. Motorcycle sales for the first half of 2018-19 stood at 2,156,506, with a growth of 27%. Commercial vehicle sales stood at 409,579, posing a growth of 54%. The company’s export business saw total sales of 1,046,225 units, yet again the highest ever with an overall share of 42%. The company has two main factory plants located in Aurangabad and Pune, both in India.The Waluj (Aurangabad) plant established in 1984 is spread over 362 hectors. Bajaj’s range of vehicles manufactured at this plant includes Discover, Platina, CT 100, Boxer, three-wheelers (RE) and Qute. This facility is certified with ISO 9001, ISO 14001 and OHSAS 18001 certificates. This plant has annual capacity of 2.4 million motorcycles and 0.9 million three-wheelers. 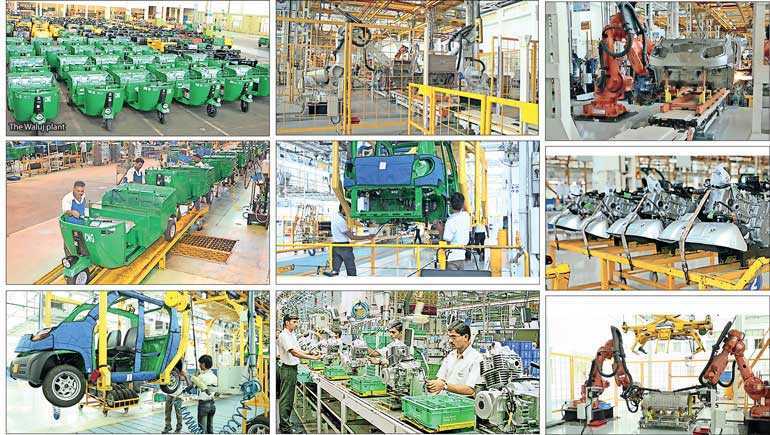 The Pune plant established in 1998 is spread over 80 hectors. The range of Bajaj motorcycles manufactured here includes Pulsar, Avenger, KTM. This facility also is certified with ISO 9001, ISO 14001 and OHSAS 18001 certificates. This plant has an annual capacity of 1.2 million motorcycles. The company also unveiled plans for its newly introduced Bajaj Qute, a four-wheeled transportation mode which falls under the recently developed ‘Quadricycle’ segment. The Bajaj Qute has been designed in response to requirements of low cost, first and last mile public transport across the world by optimising size, weight, cost and speed. It follows a philosophy of smart and sensible design. It has an eco-friendly, fuel-efficient, world-class DTSi Engine, it is smart in its size and handling, it is smart in safety with its monocoque body and it is smart in the space that it offers to passengers and their luggage. The Qute’s 216cc four-stroke, twin-spark, single-cylinder, four-valve, liquid-cooled DTSi engine generates 9.7Kw power at 5,500 RPM and 18.9 Nm Torque at 4,000 RPM. It is easy to drive, compact, lightweight and has an extremely low carbon emission of 66 gm/km.